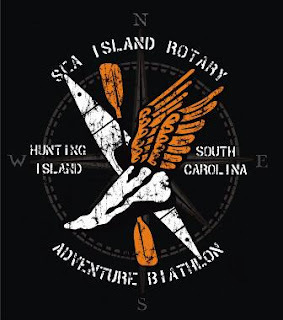 Runners and Paddlers Unite for the Sea Island Rotary Adventure Biathlon! Location: Hunting Island State Park in Beaufort SC. Take Hwy 21 S through Beaufort toward Fripp and Hunting Islands. Note: Hunting Island is approximately 15 miles from Beaufort and the park entrance tends to back up so allow plenty of time. Course: Paddlers will start and finish at the base of the Lagoon located near South Beach Parking 'J'. The kayak leg will go south out of the lagoon and then turn right into Fripp Inlet until circling a buoy for the return leg. Paddle leg is between 5 and 6 miles. Upon beaching your boat back at the base of the lagoon, the running leg will be approximately 4.5 miles through a pristine forest. Some of the course may be on primitive trails. This is an Adventure Race and you can expect some light challenges (no orienteering!). Start Time: 11:00AM * remember to come early enough to off load kayak and enter Park through gate. Park entrance requires either a State Park pass or one day pass. Gate tends to back up during peak times. * Chip Timing will be used which allows us to provide split times for paddle and run, as well as compute results accurately and fast. ** Racers will be accessed and responsible for a $30.00 lost chip fee. Age Groups and Awards: 57 Awards given! TOP 8 MALE/FEMALE SOLO, TOP 3 MALE/FEMALE MASTERS SOLO (OVER 50), TOP 3 ALL MALE RELAY, FEMALE RELAY, MIXED RELAY, TOP 2 MALE TANDEM,TOP 2 FEMALE TANDEM,TOP2 MIXED TANDEM,TOP 2 MALE/FEMALE SUP, TOP SUP RELAY TEAM MALE/FEMALE/MIXED. Categories: Solo, Relay (1 participant paddles and different participant runs), and Tandem (both participants paddle a tandem ((2 person) kayak and both participants must run and finish race together), SUP (Stand Up Paddleboards) Solo or Relay. is there a contact number for the race organizers?